Every generation for which poetry isn’t a matter of mere diligence and hard work eventually comes around to Vladimir Mayakovsky. 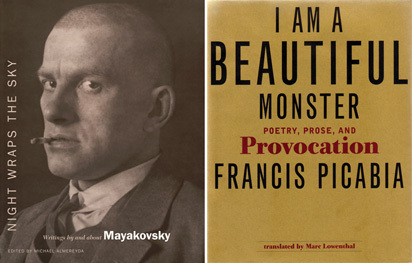 Brash, violent, mercurial — the greatest exponent, avant la lettre, of slam poetry (if poetry could ever be said to “slam,” Mayakovsky’s could), Mayakovsky herded his audience before many a public performance with a hush (“Quiet, my kittens...”) and then, while reciting poems of violent passion, theocide and weird bodily transformations, stepped aside every so often to outholler any and all of his numerous hecklers. And they were numerous. In his lifetime Mayakovsky acted as representative for the literate violence of the movement called futurism. As he matured, he lent his voice to the contentious rule of Vladimir Lenin. Yet he was loved more than any English-speaking poet could dream. When he died of a self-inflicted gunshot wound to the heart in 1934, upwards of 30,000 people attended his funeral. Filmmaker Michael Almereyda has assembled a new collection of Mayakovsky’s work, Night Wraps the Sky, in hopes that the Russian futurist will catch on in our own more meritorious age. Alas, we’ll have to wait longer to see a substantial new translation of this very important Russian author’s work, similar in scope to the 1970 Hayward and Reavey translation currently available. This will be, as my Russian-speaking friends tell me, quite difficult: Mayakovsky’s wordplay is uniquely specific to his native language and does not carry over nicely into English. So, though the new translations in Almereyda’s book do pop with life, there are far too few of them. Instead, this is a scrapbook. Memories of Mayakovsky’s life, pictures, and assessments of his legacy are presented in Night Wraps the Sky so carry over his passion to “shine through to the new tomorrow.” Admirers of beautiful contention will love this, and this should whet their appetites for more. Another of modernism’s great egoists made a comeback late last year in an exhaustive edition, handsomely designed. Francis Picabia was the self proclaimed “genius, idiot, funny guy” — add to that autodidact, reactionary, nihilist — of French Dadaism. As a painter, he considered himself a rival to Picasso, and when he couldn’t paint, he wrote poems, aphorisms, manifestos and diatribes, all collected in I Am A Beautiful Monster. Picabia, who flourished in the first three decades of the 20th century, seemed to demand from his contemporaries the respect of a 19th century bourgeois painter of the Ernest Messonier type (with all the roast beef that implies), all the while presenting a public face more or less like Popeye. “My head swells / enough to drive one mad,” he wrote. That swollen head of his got him in trouble with his contemporaries every step of the way. His poems — tightly wound machines of invective and sharp imagery — feature the most beautiful illogic ever created in that most illogical century. He was also a very strong aphorist, which shows the influence of Nietzsche, the only writer he read with anything approaching real seriousness. I find on one page: “It’s really only nonentities who have genius in their lifetime.” And on another: “Spinoza is the only one who hasn’t read Spinoza.” You don’t chew these little morsels without having to spit them out.